Boiler Installation What’s The Role of A Central Heating Expert? If you are planning to have your home renovated, you may need to have a home boiler installation and upgrade as well. While your current heating system may be designed specifically for your home in its current state, any major changes to your home may affect efficient heat distribution. Think about these important factors so you can make sure your home will stay comfortably warm after your renovation is finished. Boiler Installation: Should You Get a Mid- or High-Efficiency Boiler? Your boiler is a critical home heating appliance, especially during the colder seasons. You’re going to need your boiler to work quietly, reliably and efficiently. If you’re having constant problems with your current boiler and have observed your energy bills skyrocketing, chances are you need to replace it with a new boiler installation. When it comes to purchasing a new boiler, one thing you’ll constantly hear a lot about is the comparison between mid-efficiency and high-efficiency models. The cost of boiler installation will probably be your primary concern. Comfort-wise, you might not really notice any difference between mid-efficiency and high-efficiency boilers. However, there are several short and long term cost factors that will come into play, and each must be considered carefully. You need to evaluate your options to the full in order to choose the boiler system with the efficiency rating that’s right for you. When you get quotes for a replacement boiler, make sure you get estimates for both mid- and high-efficiency models. In most cases, high-efficiency varieties will cost 20% to 50% more than mid-efficiency ones. Ask for the difference in features between them so you can understand why one costs more than the other. You should also ask about the tax reliefs and schemes you can get with each boiler type. Regarding years of use, it should come as no surprise that you’ll be able to save more money in the long run with a high-efficiency boiler. Energy consumption experts say that it’s possible for a high-efficiency boiler to make up the cost difference within one to two years. If you would like to learn more about high-efficiency boilers and the benefits they offer, do not hesitate to contact a trusted plumbing service. What Makes A Boiler Installation Efficient? Seasonal Efficiency of Domestic Boilers in the UK (SEDBUK) is how boiler installation efficiency is calculated. It’s a letter based system that range from A to G. But these letter labels have been removed to prevent confusion with the European energy labels. These use similar evaluations but are based on different criteria. So the old system is SEDBUK 2005. The new SEDBUK 2009 system replaces it and shows the result as a percentage rather than a letter. The differences between 2009 and Sedbuk 2005 is largely down to differences in calculations. Using a boiler for heating water in the summer and using a boiler for heat a whole house in winter give differences. As it gives a higher efficiency amount manufacturing companies frequently conspicuously show the Sedbuk 2005 evaluation within their guides – so beware! LB Plumbing and Heating in Harrow, London, has published an article that stresses the value of the new Combi boiler for homes that have very little space for boilers. “Good boiler installation advice is difficult to find and people certainly appreciate great things in small packages, and those living in flats are no exception. 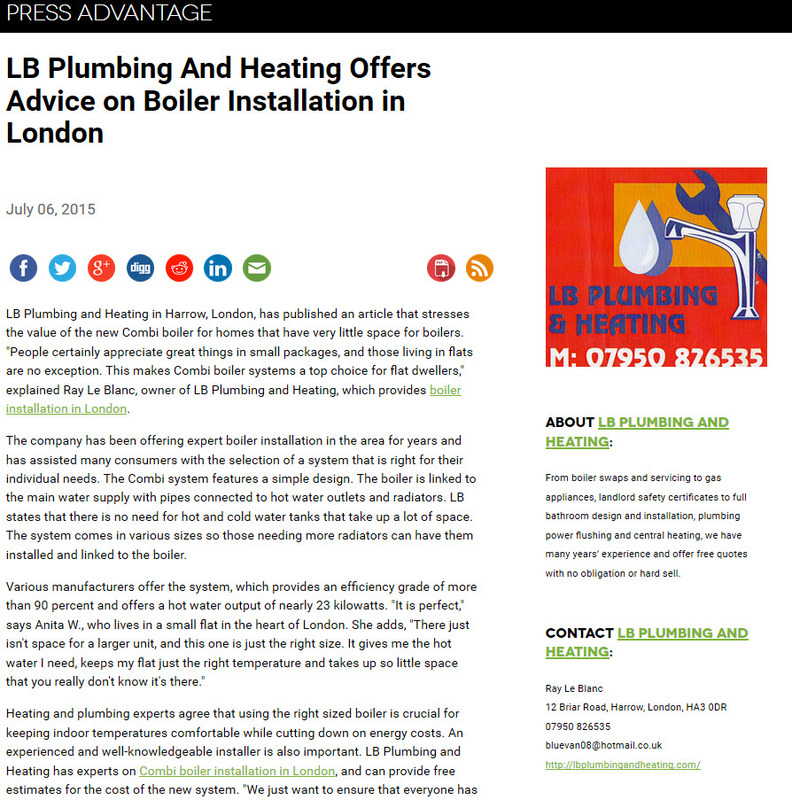 This makes Combi boiler systems a top choice for flat dwellers,” explained Ray Le Blanc, owner of LB Plumbing and Heating, which provides boiler installation in London. The company has been offering expert boiler installation advice in the north London area for years. Ray has assisted many consumers with the selection of a system that is right for their individual needs. The Combi system features a simple design. The boiler is linked to the main water supply with pipes connected to hot water outlets and radiators. LB states that there is no need for hot and cold water tanks that take up a lot of space. The system comes in various sizes. So those needing more radiators can have them installed and linked to the boiler. Heating and plumbing experts agree that using the right sized boiler is crucial for keeping indoor temperatures comfortable while cutting down on energy costs. An experienced and well-knowledgeable installer is also important. 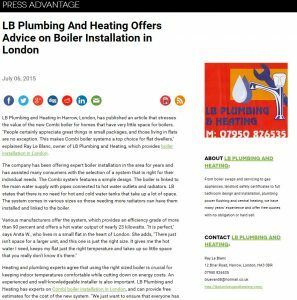 LB Plumbing and Heating has experts on Combi boiler installation in London, and can provide free estimates for the cost of the new system. “We just want to ensure that everyone has the right boiler for their comfort and space needs,” says Le Blanc. For more information about the Combi system, consumers are urged to contact an experienced team for a boiler installation London, such as LB Plumbing and Heating. 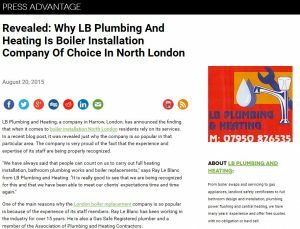 LB Plumbing and Heating, a company in Harrow, London, has announced the finding that when it comes to boiler installation North London residents rely on its services. In a recent blog post, it was revealed just why the company is so popular in that particular area. The company is very proud of the fact that the experience and expertise of its staff are being properly recognized. One of the main reasons why the London boiler replacement company is so popular is because of the experience of its staff members. Ray Le Blanc has been working in the industry for over 15 years. He is also a Gas Safe Registered plumber and a member of the Association of Plumbing and Heating Contractors. Secondly, the company is known for the friendliness and approachability of its workers. They want to make sure that people have a positive experience when they go through a renovation, and they hope to achieve this by being completely open and transparent. LB Plumbing and Heating wants to do everything to make sure the trust their customers have placed in them is not broken. In so doing, the company is also known for honesty. They create a quotation before starting a job, so that customers know exactly what they will have to pay. Furthermore, LB Plumbing and Heating always keeps customers appraised of their rates, so that people are able to stay within their budget and do not get a shock when they receive the final bill. To this end, Ray attends courses on the newest plumbing and heating technologies in his spare time. This ensures that when it comes to boiler installation North London residents can depend on LB Plumbing and Heating. 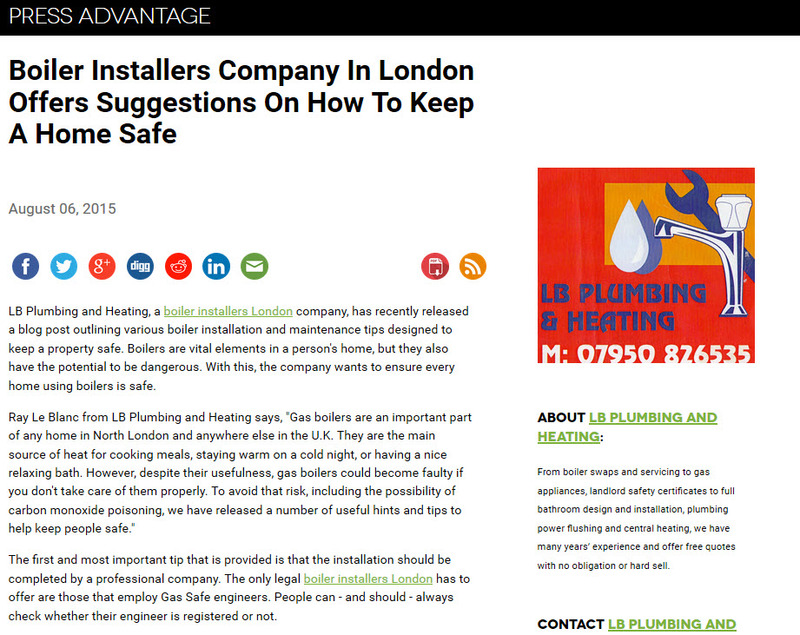 LB Plumbing and Heating, a boiler installers company in London company, has recently released a blog post outlining various boiler installation and maintenance tips designed to keep a property safe. Boilers are vital elements in a person’s home, but they also have the potential to be dangerous. With this, the company wants to ensure every home using boilers is safe. The first and most important tip that is provided is that the installation should be completed by a professional company. The only legal boiler installers London has to offer are those that employ Gas Safe engineers. People can – and should – always check whether their engineer is registered or not. What Makes a Good Boiler Installers Company In London? Secondly, regular maintenance is vital. And the maintenance work should also be done by Gas Safe engineers. These engineers should periodically check to see if the boiler is operating at the appropriate settings. 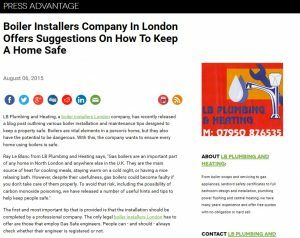 In addition, the boiler installers company in London should ensure that all safety devices are functioning properly and that nothing is blocking the various vents. Furthermore, all dwellers should only use the boiler for its intended purpose. Finally, the boiler installation North London company explains that it is essential to be always on the lookout for possible carbon monoxide emissions. At least 50 people each year die due to carbon monoxide poisoning. Carbon monoxide is known as the ‘silent killer’ because this particular gas is odorless. It is a good idea, therefore, to have a carbon monoxide detector installed next to gas appliances. This device should provide an audible warning when it detects the presence of the poisonous gas so that the homeowners can do what is necessary to remedy the situation.